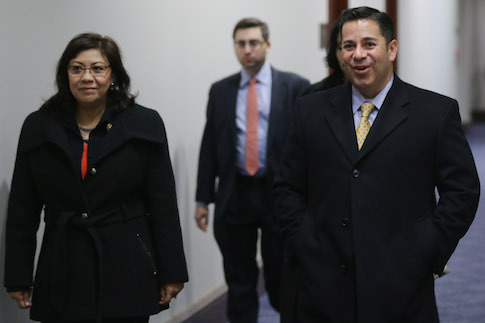 Rep. Ben Ray Luján (D., N.M.), chairman of the Democratic Congressional Campaign Committee, on Thursday announced the fourth round of candidates in the DCCC's highly competitive "Red to Blue" program, which is aimed at unseating Republican lawmakers in districts across the country. The DCCC touts the Red to Blue program on its website as a "battle-tested program" that provides "top-tier candidates with organizational and fundraising support to help them continue to run strong campaigns." After four rounds of announcements, the program has 33 candidates on its list who have met the program's standards related to grassroots engagement, local support, campaign organization, and fundraising, according to the press release. The DCCC said the newly added candidates not only have a winning campaign infrastructure, but they have deep ties to the communities they seek to represent and have strong records of service. "All across the country, candidates with records of service are connecting with voters, earning their trust and running increasingly competitive races," said Luján. "The candidates in this new round of Red to Blue are running grassroots campaigns bolstered by local endorsements and key indicators of support in their communities. We’re also incredibly proud of the diversity represented in this latest list –in terms of race, gender, geography and backgrounds – and I am confident these individuals will play a critical role in helping take back the House." The national press secretary of the National Republican Congressional Committee, Jesse Hunt, dismissed the program and said it is just another attempt by the DCCC to push progressive candidates out of the open Democratic primaries. "The DCCC loves to meddle in open Democratic primaries and this is another attempt to stack the deck against the most progressive candidates," Hunt said. "Though it appears they were afraid to raise Laura Moser’s ire again." The DCCC has received backlash for attempting to interfere last month in multiple Democratic primaries. In particular, the group targeted Texas Democratic congressional candidate Laura Moser by publishing opposition research against her on its website. While the DCCC received backlash from members of the media and Democratic activists, including former staffers from the Obama administration, the group stood by its strategy. That strategy, nevertheless, backfired earlier this month when Moser qualified for a May 22 primary runoff. The committee was also accused by Greg Edwards, a black pastor running for a newly-drawn seat in Pennsylvania, of trying to push the only Democratic candidate of color out of the race. The DCCC denied this accusation and said its strategy was based on the district in question being new, saying it was a special situation where candidate-organizing became important. The Justice Democrats, an influential progressive group, did not buy the explanation, slamming "wealthy white donors and revolving door consultants" for trying to interfere in the race. The DCCC touts its "Red to Blue" candidates for having deep ties to the communities they are trying to represent, but one of its most vocal candidates, Randy Bryce in Wisconsin, openly admitted back in January that his campaign is actively reaching out to New York and California for donations. Bryce seeks the Democratic nomination in the race for the seat held by Speaker of the House Paul Ryan (R., Wis.). This entry was posted in Politics and tagged 2018 Election, DCCC, NRCC, Paul Ryan, Randy Bryce. Bookmark the permalink.